Blogging part time and holding down a full time job means it's not always easy finding time to photograph, edit and then write about products, places and experiences. Evenings and weekends are really the only times we have to work on the blog. Then, either there's something round the house that needs doing or we're just too tired. But all excuses are now null and void. Blogging is our passion, our hobby and it needs a bit of TLC. After our big makeover/ revamp/ rebrand earlier in 2015, we really want to give this blog a real effort and give ourselves a big kick up the backside. We've been blogging now for almost 5 years (on and off), which is crazy! You should see some of the posts in our archives, they're awful! But we're proud of every single one due to the response we got from other bloggers and girls around the world. Through blogging, we knew that others shared our passion and love for all things beauty (and fashion, lifestyle, food, travel etc!) and that there was a whole community out there, just within our reach. Blogging is just amazing. With hoards, and I mean HOARDS of products to blog about this year, we've come up with a fail-proof plan to keep our posts regular and consistent. In 2015, let's face it, our blogging just wasn't up to scratch. Posts were irregular, maybe one a week if we could manage it, but with this New Year we want to be better and blog better. To do that, we've enlisted the help of TOAD Diaries so that we can plan and schedule ahead, ensuring our blog is in tip top shape this 2016. These diaries are completely personalisable, giving you the choice of size, binding, design, layout, duration, start month etc! You can even add the name of your blog and blog details (incase you lose it!) to make it uniquely special to you and your blog. Using a planner like this is great for allocating your time more efficiently is definitely the way forward. Planning both what you will post and when it will go live can even take your blog to the next level; upping your visibility on search engines and giving your followers more regular content. This can only make your blog more successful in the long run! Seeing our stats increase over the past 6 months, once we started blogging more regularly, has given us the little kick up the bum we needed to keep it up, or one better, kick it up a notch. The main benefit of having your blog posts written on paper, is that once they're there, they're almost set in stone, so you feel you have to stick to them (if that's what you think may help you, otherwise write in pencil!). That way, you'll never miss a day's blogging and you can plan the rest of your free time around it! For a lot of bloggers, scheduling posts online to publish at a particular time, on a particular day, is their way of being organised. However, when we're going to plan our posts a week (or several) in advance, having it there on paper is so much more convenient than having to scroll through the entire posts list. With a simple flick through the diary, you can see exactly what weekday they go out and slot any new ones in any clearly visible empty days. This also helps if you blog on particular days, for example every Monday, Wednesday and Friday so you can see whether the physical day has something scheduled. On post lists on blogger for example, you can only see the date, rather than the day, which is useless unless you have a calendar to hand too. I'm quite notorious for starting blog posts, or taking photos for future blog posts and then never publishing them. With the use of a special blogging planner, I would be able to tick off blogs once they had been finished and published ON the day that they were scheduled to be. How good would that be?! Keeping my blogging scheduler separate from my day-to-day planner will also mean no post will get over-looked or forgotten about. With hope, you'll soon be seeing regular, consistent (but varied) posts from us this year! 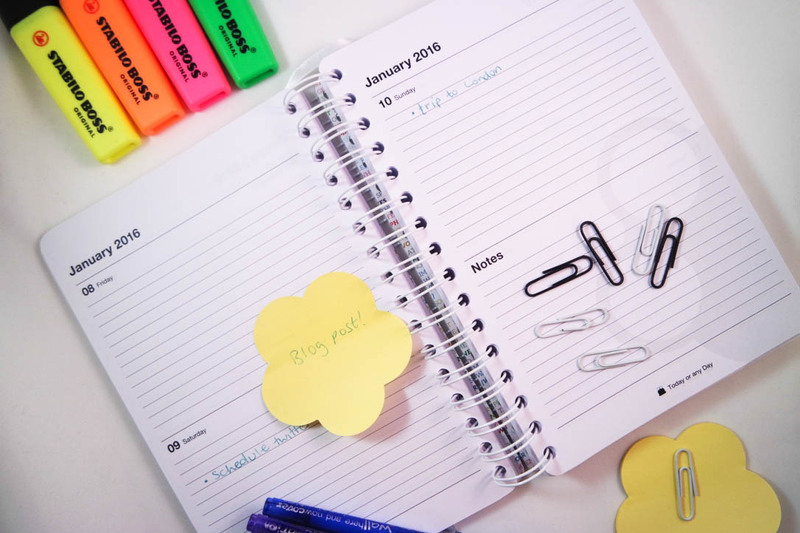 Keeping posts regular by scheduling them either online or in a diary like this could help you become more organised this New Year, blog better and even grow your blog. 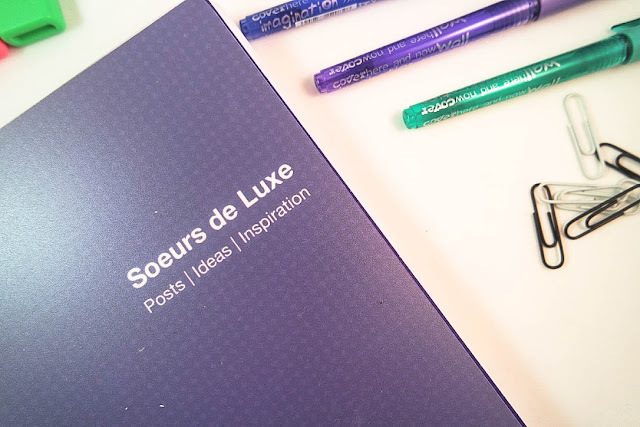 How do you keep your blog posts organised?